Swing away Merrill. Merrill... swing away. A sibilant breath is slowly drawn across catgut: in and out, up and down the strings of a violin. Matching the sighing notes of the unseen fiddler, a light diffuses out of the shadows before dissolving again – a malfunctioning flashlight in a darkened farmer’s field? Whistled by winds and bleated by horns, a frantic three-note motif replaces the calm respiration. Something is out there in the blackness. Bold words are glimpsed fleetingly in the flickering light, like names shouted into the empty night. 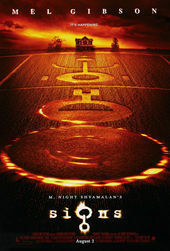 Employing only text, light, and shadow – along with James Newton Howard’s alarming and Hermannesque main theme – the title sequence for M. Night Shyamalan’s Signs relentlessly increases the tension before anything remotely suspenseful has even happened. 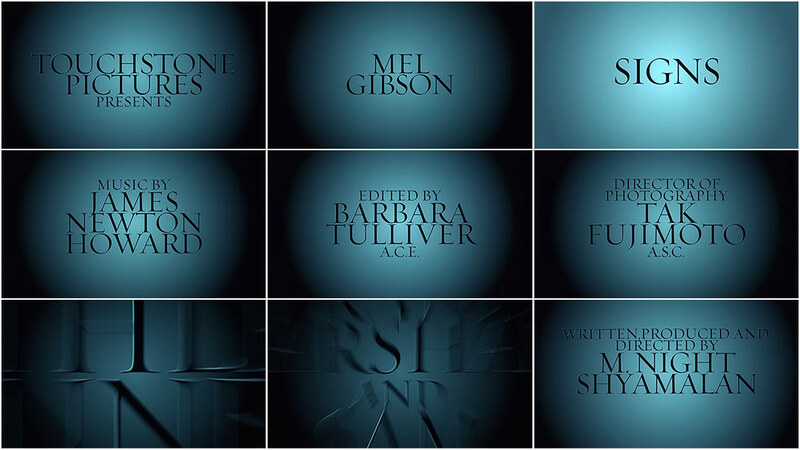 Though it finishes on a name now synonymous with cinematic twists, Picture Mill’s main titles have a gleefully old fashioned tone that lays the groundwork for Shyamalan’s surprisingly twist-free scary movie opus. Creative Director WILLIAM LEBEDA revisits his work on the opening titles and discusses their creation at Picture Mill. WL: I got a call from Night and the editor Barbara Tulliver asking if I could take a look at the titles for Signs. I had done the titles for The Sixth Sense and he was looking for some fresh ideas for his new movie. They had a temporary credit sequence mocked up with the music, but they just weren’t feeling it. He sent me – on a VHS, I think! – the temp sequence and the amazing James Newton Howard score. It had such a strong Bernard Herrmann vibe, but it just wasn’t being used to its full potential. I asked Night if I could see the movie, but he refused, saying that it would be better if I saw it in the theater with an audience. I had seen the trailer, and knew it was vaguely about aliens and crop circles, but that was it. But the trailer was great – and scary. It felt more like a classic thriller… long shadows and creeping dread. Signs is very much a classic monster movie in a modern setting and I think the titles capture that tone perfectly. When I design for score-based sequences, I listen to the track over and over. And I think that Herrmann-inspired score sunk in permanently at some level… even now I can play it over in my head. And because the score was so critical, we decided to do short animation tests rather than boards. Boards wouldn’t capture the drama of the animation combined with the score, and that was the biggest part for me. We did three or four tests for different concepts. We explored some super graphic stuff with abstract crop circles, and one concept that was 3D text moving into and out of a light source. That 3D one is still something that I refer to for other projects, even though Night didn’t choose it. We explored a variety of fonts that were reminiscent of the trailer work as well as some others that were more neutral, so the animation could really shine. Everything we presented was in a really reduced palette, either grayscale, black and white, or with a tiny hint of red. Almost no color at all. Night really liked all of the other concepts, especially Epiphany and Revelation. But Requiem was such a strong statement, the boldness matching the boldness of the score, that there really wasn't much of a contest. Revelation is the 3D one that I still refer to... it's really special. The one Night chose couldn’t be more classic… it would be equally appropriate on a ’40s film noir as it is on Night’s sci-fi thriller. Signs is very much a classic monster movie in a modern setting and I think the titles capture that tone perfectly. Around the same time as Signs, I think there was a lot of energy to make type either very small or distressed or adjusted thematically in some way – like crosses for “T”, that kind of thing – which is completely awesome. But something about the scale of that theme was demanding big type, as big as I could make it and still have the multiple-name cards fit on-screen. I wanted something big on screen, but not horsey. And the thin Helvetica cuts feel very fashion-y to me. I wanted something a little gothic, like a horror movie, so I looked into thin serifs. And I finally settled on Requiem from Hoefler. I think I selected the display cut to have that razor edge sharpness, while being so large on screen. Coincidentally, I often think of Requiem as a slightly religious typeface, and Signs is very much a movie about faith. But there was no way for me to know that, since I hadn’t seen the entire movie. Sometimes things just work out that way. Ms. Tulliver called and said she loved her credit because it came smashing in over her head in the theater! Night edits his movies in Philadelphia, so we had to send VHS or ¾” tapes back and forth. Ridiculous! I frankly don’t know how we got anything done back then. Certainly it was a slower process, especially cross-country. In terms of time, Signs is one of those sequences that came together very quickly. Once I had laid out the type for the screen, I worked closely with an animator and we talked about the feeling of the score, how it felt like motion; the slow and eerie dissolves, hard cuts, and fast, fast zooms were all in the rhythm. We just listened closely and animated carefully to maximize the drama that was already in the score. Ms. Tulliver called and said she loved her credit because it came smashing in over her head in the theater! Regarding the color, the original pitch was black and white, and it was presented and approved in black and white. And then in final color timing, there was concern that the release prints wouldn't stay true greyscale. This was way before DI and digital projection, of course. And the prints would veer to green – or worse, pink or yellow – through the print process. So it was decided to make them a more deliberate color, and the cool blue grey was the choice. I never think of them as blue grey, even though in the theater – and on DVD – they are. I had the opportunity to meet with Night in LA to show him the final version. He was in town while they were recording the score and I was able to be in the recording studio while the orchestra played the main title theme, while my temp animation played on screen behind the orchestra. Just fantastic. And after all that, I showed him the final version on ¾” tape in a small side room. And that was that! Kind of anticlimactic after seeing it performed live, certainly. A couple of remarkable things came from creating the titles for Signs… first, it cemented a long working relationship with Night Shyamalan. I have designed all of the titles for his films since, and have had many occasions to work with him, including directing Second Unit on The Happening. The second is far more dubious and hilarious. 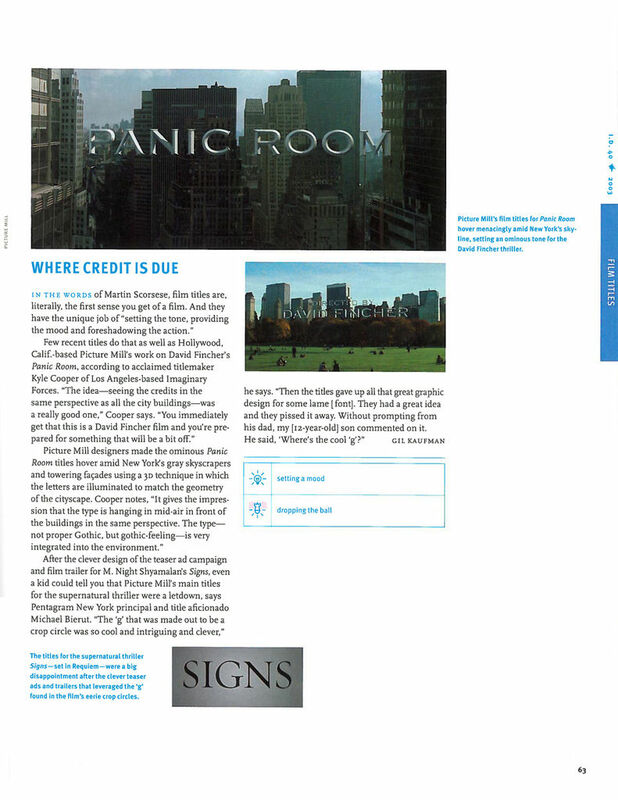 Signs came out the same year as Panic Room, and ID magazine ran a special Best and Worst edition the following year. And Picture Mill was named both the best AND worst title designer of the year for our work on Panic Room and Signs, respectively. Michael Bierut was quite critical of Signs, citing all sorts of missed opportunities. I am very proud of this. It might be my finest hour.